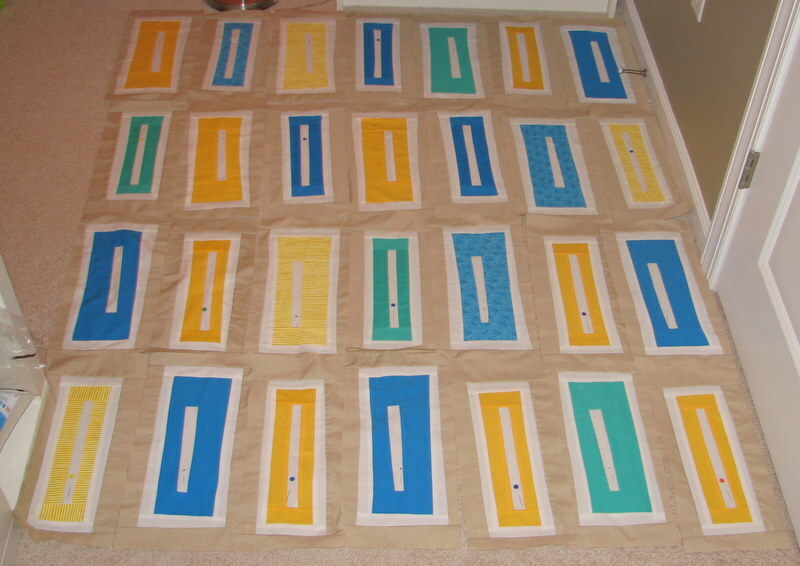 Other posts on this project: Crete Quilt, Crete Quilt 2, Crete Quilt 3, Crete Quilt 4, Crete Quilt 5, Crete Quilt 6. I squared up all the blocks and laid them out in the pattern I like. That took forever, actually. I’m going to need to do a lot of calculating and sizing as I go, these blocks are seriously all different sizes. That should make for some entertainment when I try to get a neat look while sewing them together. I think I will have to take each row going down and make sure that is squared and centered. So each vertical row may end up a slightly different width. At least the blocks are supposed to look sort of off center and inexact. It’s coming along, though! 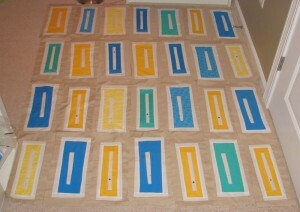 I have border pieces already cut out, I may end up extending that border once I see the overall size of this.